Both cuts truly shine when SV technique is applied. Mike, normally I would think that 15 minutes isn't enough to bring prime rib or rib-eye to medium rare, but I guess that depends on the starting temperature. Why do you use 61C, instead of something like 55.5C? How did you sear it afterwards (or before)? thanks for the great inspiration you ALL gave me over the past months! I did some experiments with sous vide cooking, and all went fine...until yesterday. I cooked brisket at 57°C for about 40 hours. The meat came out quite nice looking, but after cutting, it looked quite well-done and was very dry to eat. It had a strange consistency which was quite tender but on the other hand quite tough...the taste was good anyway. But overall it lacked the moisture I usually get from meat cooked SV. Thickness between 0.5 and 2 inches, but the result was absolutely homogeneous. 1. Water temperature was constant @57°C, I use a lab waterbath with perfect ability to hold temperature. 2. Vacuum bag was intact for the whole cooking process. 2. I put some frozen beef stock in the bag for marinating - does this matter? 3. After opening the bag, I put the meat in the oven at 90°C for about 5-10 minutes to cook the sauce from the bag liquids - was this the reason for the meat drying out? 4. How come that the meat looked well-done at this temperature? Was the cooking too long (I suppose not). I would be very thankful if you guys could help me out - keep on writing your experience here, it helps GREATLY!!! 57C plus 10 minutes in a 90C oven plus subsequent resting time (especially if the meat rested in the pan you had previously had in the oven) could take the temperature of the beef up another 14 degrees. And then you're right at the temperature of hammered-through well done. SL is right on about having put it in the hot oven after the meat came out of the bag. 2) The marbling makes a huge amount of difference. When I cook it, it spends no time in the oven, it gets blasted with a propane torch to brown the outside -- but the interior is pink pink pink. The first few times that we did brisket, we were not impressed because the meat came out as you described (although pink inside and now well-done). On both occasions, we were using the "flat" part of a brisket that had almost no interior marbling. I have found that the "flat" can have marbling -- but you may have to go to a couple of butchers before you find it. For the next couple of experiments, we did a whole brisket and found that the more marbling there was in the brisket, the better it was. When cooking the whole briskets, one end was a bit too fatty (but made delicious hash the next day when diced and sauteed with potatoes and onions till browned) and the other end a bit to dense/dry but the middle section was delicious: tender and moist. You may have to hunt down the right piece of meat--the flats of a lot of brisket is very dense with little to no interior marbling -- but you should be able to find some that has marbling. The next time, we are going to get some Wagyu brisket because it has much better marbling even in the flat part than most of the briskets from local butchers. I agree with the above posters. I cook the flat part of Choice grade brisket for 48 hours at 55.5C, with nothing on the brisket except some chipotle dry rub on the fat side and perhaps some Liquid Smoke. The chipotle rub colors it dark enough that it doesn't really need even a torch, much less searing in a skillet. Just don't let the butcher slice off too much of the fat. Leave the meat in the bag, but pour off whatever liquid there is, put it in a sauce pan and bring it to a hard boil, then strain off the scum with a chinois. Add whatever precooked vegetables you would like to that au jus sauce, e.g, some caramelized onions and carrots, to make a simple gravy or topping. Slice the brisket thinly (2 mm) across the grain, like a London broil, pour the topping over it, and the results should be fantastic. Robert, 15 minutes would most certainly be not enough time for a large cut like whole prime rib, and I would have give it another 5-10 minutes for a rib-eye steak. However, cap of the rib-eye is a relatively thin muscle, so I cook it just like I would cook tenderloin, as far as time/temp are concerned. There is no benefit of having a cooking bag in the bath as it being warmed up, if that's what you are asking. 61C is internal temperature for any steak done rare, 62-63C - medium rare, 64C - medium. 55.5C would be undercooked by any standards. Typically, I flash sear my steaks in very hot clarified butter ( 5-10 sec. on each side) after poaching, immediately prior to serving. What I did not consider was that putting the in fact cooked meat in the oven will dry it out completely and bring it to well-done, especially because it was a very thin cut. I will keep an eye on that for sure! I prepared the meat myself, it was a very big cut of 2.5 kg with a lot of fat between the muscle meat. I removed most of it because I am not sure, how this fat would influence the taste over such a long cooking time. The cut itself was not marbled at all, so it might also be not the best base for a good SV brisket. Unfortunately, the meat in Germany are is cut quite different from that in the US which also can be a problem... But I should contact a real good butcher for having a cut that is more suited for cooking SV. 2. Maybe lower the temperature to 55 or 56°C. 3. Cook it for full 48 hours. Of course I am going to give you impressions from that as well! Did you mis-type those temperatures? If not, your rareness scale is very different from mine. Did you mean 51C for rare, perhaps? 61C is 142F which is much hotter than rare (which is somewhere in the mid 120s). If I ordered a steak and got one cooked to 142F, I would send it back and would probably not return as a diner. I think that most people would consider anything over about 133F or 56C to be heading into medium range for beef. With 129 to 133 (or so) to be medium rare and rare to medium rare in the 51C (124F) to 53C range. I'm with e-monster. I typically do medium-rare beef sous vide to around 54C, and that's how it comes out: bang-on medium rare. FWIW I too agree with e-monster. I find that in order to get anything cooked SV which resembles rare steak cooked conventionally I cannot exceed a core temperature of 48C/49C. At 54C any beef I've cooked is what I would call medium - i.e. uniformly pink throughout with no red/raw appearance at all. Cooking at any temp higher than 54C the beef starts to lose it's pinkness and becomes increasingly grey as the temperature is increased. For me any "greyness" at all starts to get into what I describe as well done. The ranges for rare, medium rare etc are all over the map. Many sources disagree strongly about this. The Wikipedia entries listed above are more or less consistent with my own taste. For beef, I would say that 130F/55C is medium rare. Rare is 120F-125F (48-52C). Others chimed in before I had a chance, but I agree with the general tenor. I cook my steaks at 55.5C, partly because my wife doesn't like particularly rare beef, and also because that is sufficient to pasteurize them (depending on the time, of course). If I were cooking for myself, I would aim a little lower. What I meant by starting temperature was the resting temperature of the steak before throwing it in the SV bath. Was it at freezing or below, at refrigerator temperature (around 38-41F), or ambient room temperature? I haven't calculated how long it would take a steak to come up to say 131F from say 70F, but even then I doubt that 15 minute would suffice, unless the steak was quite thin. ... I find that in order to get anything cooked SV which resembles rare steak cooked conventionally I cannot exceed a core temperature of 48C/49C. At 54C any beef I've cooked is what I would call medium - i.e. uniformly pink throughout with no red/raw appearance at all. Cooking at any temp higher than 54C the beef starts to lose it's pinkness and becomes increasingly grey as the temperature is increased. For me any "greyness" at all starts to get into what I describe as well done. 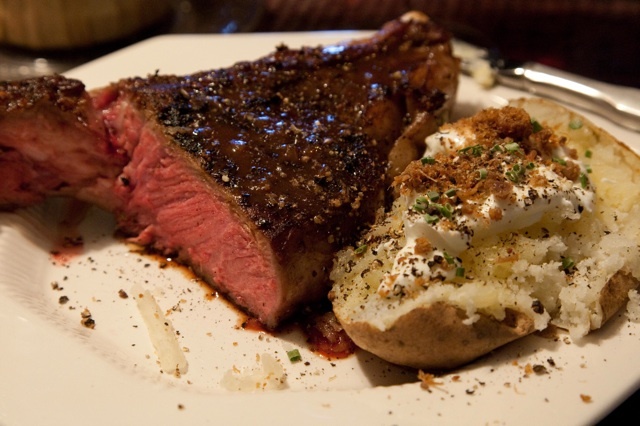 Whether we apply conventional cooking technique, or cook our steaks SV the goal is to achieve right internal (core) temperature for a desired degree of doneness. Needless to say, SV allows to achieve much more precise internal temperature, as well as allows to do it with ease. temperature points of doneness are identical for proteins cooked conventionally, and for the same proteins cooked SV. I would also like to ask any of you to support your statements about degrees of beef doneness with appropriate pictures, please. No, that is not correct for many reasons. Beef cooked to a the same internal temperature - say 130F/55C should be more or less the same chemically, but it will NOT look the same with different cooking methods. Most people assess "doneness" by color or visual appearance. Cleary that is your goal in asking for photos. But that depends crucially on several things, most important of which is access to oxygen. Sous cooked meat can be much less red, until you let it sit in the air where it becomes redder. The length of cooking time can also affect redness. Indeed as mentioned in other posts on this thread, long slow cooking can under some special circumstances fix the meat color to bright red even at very high temperatures (160F or above). Conversely, if cooked without oxygen you can have fairly colorless meat at quite low temperature - especially intially when first taken out of the bag and cut. The cut and grade of meat can affect redness too - look at heavily marbled Japanese wagyu ("Kobe") beef - it looks light pink even when raw! In fact, the sous vide cooked steak cooked for several hours at 130F/55C will look different if you cut it immediately after taking it out of the bag, or cut it and let it sit in the air for a few minutes. It will not in general look identical to a quick grilled steak. Similar yes, after it has a chance to get oxygen on it, but it is incorrect to expect it to look the same. Another factor is that most conventionally cooked meat has a strong temperature gradient - if the center is at 130F/55C, then that is often only a thin strip exactly at that temperature. As you move away from the center the temperature changes - getting quite high (and the meat gray) near the edges. 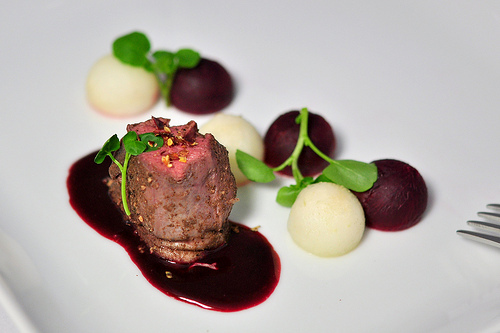 So you can't expect sous vide that is perfectly uniform to look the same unless you isolate a small portion. Photos over the internet are nice to look at, but don't expect them to accurately convey doneness. You won't be able to tell the difference between different levels of doneness. To really get good color reproduction you need a calibrated monitor, and color management software, and the right viewing conditions in the room. Web browsers and JPEG files are typically NOT color corrected this way. You also need to take the photo with proper white balace and camera profiling. For my cookbook we are going to try to print some meat color tables that are accurately printed, but this is a real challenge. Don't expect that eGullet photos show you accurate color. In fact, look at this thread or other threads - a very common remark people make about their own photos is that they don't look the way the food did on the plate. That's because of all of the variations in camera, JPEG processing, monitors and color management. The photos on the Certified Angus beef site show all of these effects. The likihood that you could match color closely enough to tell the difference between say "very rare" and "rare" is slim to none unless you had calibrated files, calibrated monitors, color management software and the whole works. The photos on the certified angus site are almost after the meat has had a chance to get oxygen for a while while the photographer set up the lights. This would make them significantly redder than they would be immediately upon cutting. But, even with all those limitations, the photos look wrong to me. "very rare" to me means that there is some translucency characteristic of partially raw meat. This starts to fade with cooking, then goes away completely leaving a red, but opaque meat surface. This is always a bit hard to see in photos because it depends on a subtle optical quality of the meat, not just the color. However, I don't see that in their "very rare" which to me means that it is NOT "very rare". Or, if want to call what they say is "very rare" then you need to define a "very very rare" which seems like a bit of a waste to me. That is consistent with the fact the Certified Angus people are about 10F/5C too hot on most of their grades. For me "very rare" would be more like 120F than 130F. But anyway, it seems that the Certified Angus people have a very different idea of beef doneness than I do, or for example than the chefs at the culinary school I attended in France. Which is fine - this is all about taste, so there is no absolute right or wrong. Your earlier claim that the temperatures you posted are a universally accepted standard is simply not true. I am having difficulty finding any chefs I admire who use the ranges that you posted. If that is how you like your meat, that is great. It is (as Nathan has mentioned) subjective and a matter of taste. Photographs of meat at various temperatures is hardly proof of anything. I have a lot of photographs of cooked meat (I have posted quite a few on this site), but they hardly prove anything. I don't see you saying "e-monster posted a picture of meat that was cooked to 133F and it sure looks like it is in the medium-rare to medium range". Lighting conditions, etc. have a lot of impact on the appearance -- even if the person taking the picture does not have a vested interest in making the food look appetizing. 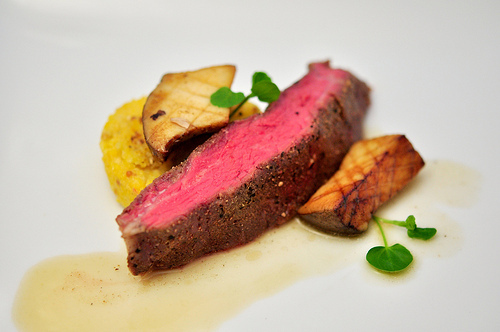 The Certified Angus Beef association does has a vested interest in making the food look appealing. With PhotoShop, it is easy to adjust the color content of images. I have a friend that is a commercial food photographer...let's just say that what you see in pictures is not necessarily an accurate depiction of reality. A lot of work goes into making the food look like they want it to for the picture -- and there is no guarantee that to get the picture of rare meat that it was cooked to the temperature in their tables. But that is really neither here nor there. I will take the word of a host of food experts over pictures or a beef grower's organization -- especially since the word of those experts is completely consistent with my experience. I cook meat to 129F to 133F a lot -- I have never had a steak come out of a 129F bath that would be considered rare by more than a few people. The tri-tip that I cook to 133F comes out with a degree of doneness such that the people to whom I have served it (many of whom have considerable experience eating food from world-class chefs like Grant Achatz and Thomas Keller) have disagreed with each other about whether it could still be called medium-rare or whether it is approaching medium. As Nathan pointed out, any Google search will show that there is no objective answer, even among professionals, as to what precise temperature "rare" or "medium-rare" is. However, there is enough consensus among the top flight chefs of our generation, that there is a range of temperatures that covers what most of them would consider rare, medium-rare etc. The temps you posted are considerably higher than that range of temps. Would you consider Harold McGee to be a reasonable expert? He is considered by many professionals to be one of the most knowledgeable experts on the science of food. There is a table in his book "On Food and Cooking" on doneness. The temperatures he mentions are in agreement with what most of us have said. He specifically mentions in the table that the 'USDA" standard designations are on the order of 20 degrees fahrenheit higher than that used by most chefs. Because there is no precise definition, he provides ranges -- and I haven't found a recipe by a contemporary chef I respect whose definition falls more than a few degrees outside these ranges. That being said, it is largely a matter of taste. You are entitled to whatever idea of doneness you like. It is simply wrong, however, to say that the Certified Angus Beef's (or the USDA's) doneness tables are a universally accepted standard -- especially since they are not very close to the ranges accepted by the leading contemporary chefs. I don't know why the Angus Beef Association's pictures look so far removed from what I, at least, would consider "reality." Nathan, whom I certainly respect, tends to blame the photographer, or JPEG, or the lack of a calibrated monitor. Well, my monitor is calibrated, and I'm a photographer with about 50 years of experience, and I still would have trouble explaining the look of those pictures, particularly the degree of transparency. A much more reasonable explanation, I believe, is very poor quality control when it comes to the thermometer used. I think their thermometers are off about about 14 degrees F, as their 145F corresponds to what I get at 131.5F, using a thermometer that is calibrated to plus or minus 0.09F against NIST standards. Having a thermometer be off by 14 degrees is not particularly uncommon in my experience, and especially one of the dial-type instruments shown adjacent to the text, as opposed to whatever is lying in the pictures. Yet another explanation is that the editors, or perhaps their lawyers, decided to "adjust" the pictures and the text to make them agree with the USDA recommendations for hamburgers. The "From the Chef" page also repeats the canard that "Searing the meat locks in the juices." THere is a 50mm rib-eye steak, cooked at 53.0C/127.0F for 3.5 hours, in a 10 liter rice cooker with a Sous Vide Magic1500B controller. The SVM controller was calibrated with my Traceable 4000 thermometer calibrated to NIST standards, and I double checked the temperature of the water bath, so I'm quite certain of the temperature. I corrected the output of my Canon 1D Mark III by applying auto white balance post-processing of the photo in Lightroom to correct for the tungsten lighting in the dining room. Although this may be more accurate in the technical, 5500F daylight sense, the picture actually looks warmer and more inviting with the tungsten light, although not particularly redder, and certainly not more translucent or "wetter". I normally cook my steaks to 131.5F, but decided to try it a little more rare. just for Mike's sake. My wife, who often complains about meat being too rare, raved about it; and the two cats practically clawed my leg off begging. And my Cro Magnon ancestors smiled down on me, as I was gnawing on the bone. Any suggestions for a white-fleshed fish that does well with SV treatment? I am looking for something that will not become mushy, and will have some firmness to it. The idea that I have is to glue together a rectangular "sheet" of fillets in a quarter-sheet pan with Activa, then spread on a filling of fish mousse (made with the trimmings), minced parsley, and something like crab or chopped shrimp. Then I'd roll the whole thing up into a tube around the size of a soda can, roll in plastic film and twist the ends, bag, bind, and cook sous vide. Hopefully, when it comes out of the bath, it can simply (and carefully!) be cut into slices and plated. I could always do this with something like salmon, but I'd like to try it with something leaner and less expensive (this will be for a large group dinner). I like striped bass, its not really inexpensive but it is delicious and it holds up very well. It's a bit of a shame that the first article on Sous Vide I've seen in my home town is probably more misleading than informative. The idea of infusing strawberries with strawberry juice is interesting though! I've written to the editor of the Good Living section of the SMH and I have received a response that they've forwarded my mail on to Catharine Munro the writer of the article. If I get any meaningful response I'll post it here.